Turn meal time into nutrition time for your kitty with the Newman's Own Organics Grain-Free Liver Canned Cat Food. Made with real organic beef liver and beef broth as the top ingredients, it’s all the grain-free nutrition your furry one needs with all the flavor he’ll find irresistible. Your pal will love the juicy pate while he gets all the nutrients he needs, including essential amino acids like taurine, plus vitamins and minerals. It’s great as a complete and balanced diet for cats of all ages and even kittens, and can be used as a meal on its own or a delicious kibble topper. 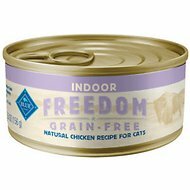 Plus, the broth is a great way to add much-needed hydration to your cat’s diet, and contains no wheat, corn, artificial colors, flavors, or preservatives. Grain-free pate recipe is made with real organic beef liver and beef broth as the top ingredients. And now only touch it occasionally. They will reluctantly eat it when the can is first opened; won't touch it "stale". Very fussys cats. 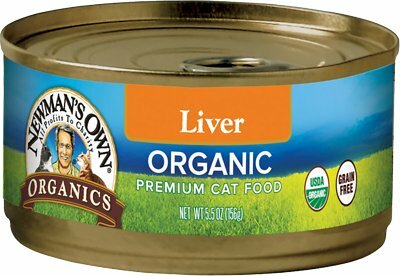 As my fussy cat will only eat grain-free tuna, this organic liver is a perfect addition, in 1 teaspoon amounts, to his 3-ounce serving of tuna. I also add a tablespoon of organic pumpkin, to help with inflammatory bowel symptoms. I keep the remainder of the can of liver in the refrigerator, with a snap-on lid. Our cat has recently been diagnosed with MANY food allergies - among them his favorite - chicken. Looking at the labels on the store shelves, we found chicken is found in most foods. The lab that did the blood work listed Newman's Organic Liver as one he could have, and yes, he loves it. Fortunately, Chewy delivers it since we couldn't find the food locally. Thanks, Chewy and Newman's. This is not so much a pate as it is a soft wet paste. None of my cats would even come close to eating this. We had to get rid of all of the cans. The animal shelter loved us. My cat seems to like it. I got this due to the fact that it is LIVER & hoping that it will help her liver even though she is on Milk Thistle, we'll see if it makes a difference when I have to take her back for a recheck. She does appear to like it so that's a good thing. Our two cats were unable to have more than a few bites of this particular flavor. It looks and smells like actual liver it's very gamey. I don't think there is anything wrong with the brand, but our cats said no. Donating the case to the local animal shelter. My cat loves the Chicken & Liver formula so I thought I'd try this one. The smell is horrendous and it is very dry. I would recommend mixing with another wet food or adding water. 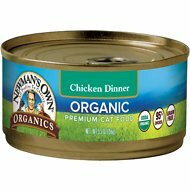 Newman's organic liver canned food is a hit with my cat. I only gave it four stars though because it's very sticky and I mix in a little water otherwise I have to scrape it off the sides of the bowl for my cat to finish it. Of all their foods, this one is their favorite. They dance around my feet, meowing when they know it's liver. Thank you for offering it, especially in the 5.5 oz! My picky cat is so happy to have this back on the menu. And I'm happy with the new larger size cans. Kitty likes the food as much as ever. So nice that Newman's has not cut corners.